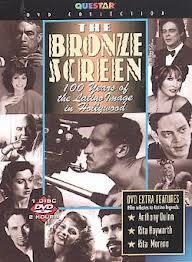 THE FILM “The Bronze Screen” is a documentary that examines, analyzes and critiques the portrayal of the Latino image in Hollywood in the past 100 years. The film explores the silent movies to urban gang films stereotypes like the ‘Greaser’, the ‘Lazy Mexican’, the ‘Latin Lover’ and the ‘Dark Lady’. Silent movie clips are notorious for portraying Mexicans as banditos. The rare and extensive film footage traces the progression of these distorted screen images of Latinos all the way to the increased prominence of today’s dignified Latino actors, writer and directors. THE FEATURED INTERVIEWS and stories in the film detail the struggles of the Latino actors' quest for meaningful movie roles in Hollywood. All of the interviews with the Latino actors and actresses were interesting and revealing. Some Latina actresses had to change their name and the color of the hair to get movie roles. LATINO ACTORS featured: Anthony Quinn, Rita Hayworth, Rita Moreno, Raquel Welch, Benicio Del Toro, Antonio Banderas, Desi Arnaz, Salma Hayek, John Leguizamo, Jennifer Lopez, Jimmy Smits, Raul Julia, Cesar Romero, Carmen Miranda, Dolores del Rio, Edward James Olmos, Lupe Velez, Ricardo Montalban, Jose Ferrer, Cheech Marin to name a few. MOVIES WITH Latino actors: “Viva Zapata” [Anthony Quinn 1952], “The Wild Bunch” [Jaime Sanchez and Emilo Fernandez 1969], “Ben-Hur” [Ramon Novarro 1925], “The Mask of Zorro” [Antonio Banderas 2005], “America Me” 1992 and “Zoot Suit” 1981 Edward James Olmos, “Week-End in Havana” [Carmen Moranda 1941], “Selena” [Jennifer Lopez 1997], “Mexican Spitfire” [Lupe Velez 1940] and more. After the showing of “The Bronze Screen”, the audience critiqued the movie. Hodgkin’s lymphoma. She grew up in Cienfuegos, Cuba and came to America with her parents before the revolution when she was just 8 years old. Pastora was a respected University of Chicago professor since 1971. She was widowed twice. I MET Pastora in Chicago’s political circles. In 1980, I coordinated an “Amigos for Daley” reception for Richard M. Daley, a candidate for Cook County State’s Attorney. At my invitation, she attended the reception held in Pilsen. She was very supportive of Daley. We discussed Hispanic politics in Chicago. She authored and edited many books on Hispanics. Adios, my friend.